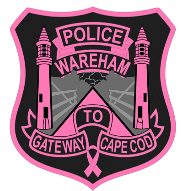 The Wareham Police Department is launching the 2017 Pink Patch Project during the month of October, selling pink Wareham Police Department patches to raise money for Southcoast Breast Health Center. The Southcoast Breast Health Center is headquartered in Dartmouth and provides breast cancer diagnostics, treatment and preventive care with a collaborative team approach throughout the South Coast, including in Wareham. The pink patch has been specially designed for the #PinkPatchProject campaign and is intended to encourage conversation and public awareness within the community about the importance of early detection of breast cancer and the ongoing fight against the disease.